Download "Richard Robinson's. Mastering Color. [Chapter 5] Mixing Color. Acrylics. Brushes of any size." 2 2 There are still a lot of colors on Quillers Wheel though, it doesn't suggest a palette of colors for you - it just shows you all the colors. Here's a more simple version so it's not so confusing CADMIUM YELLOW LIGHT CADMIUM ORANGE PERMANENT GREEN LIGHT CADMIUM SCARLET PHTHALO GREEN CADMIUM RED MEDIUM PHTHALO TURQUOISE ALIZARINE CRIMSON PHTHALO BLUE MAGENTA ULTRAMARINE BLUE ULTRAMARINE VIOLET Primary Color Secondary Color Tertiary Color You could use all these colors on your palette or just one. Obviously the colors that you use will determine the coloring of your painting. When you are starting out I think it's best to keep it simple with three colors and then add new colors as you feel yourself getting comfortable with those and wanting to try new mixtures. The obvious three colors to choose from this color wheel would be Phthalo Blue, Permanent Alizarine and Cadmium Yellow Light. These three colors will give you a wide range of color mixtures. However, I've seen several sources quote these 3 colors as the best possible primary colors: Phthalo Blue, Magenta and Cadmium Yellow Light. So that's another palette you can try out. 3 3 Richard Robinson's In this painting I've used a palette of Ultramarine Blue, Permanent Alizarine, Cadmium Yellow Mid and Titanium White. Trying out different palettes is like trying out different tinted glasses - it lets you express what you are seeing within a certain color range. Using a simple 3 color (Primary) palette for quick outdoor sketches. 4 4 Here's another way to choose a palette; we could just use the six colors which make up the star pattern - 3 primaries and 3 secondaries. That would give us a palette of: CADMIUM YELLOW LIGHT Cadmium Yellow Light Permanent Green Deep/Phthalo Green Phthalo Blue Ultramarine Violet/Purple Alizarine Crimson Cadmium Red Light Zinc White/Tinting White Carbon Black/Lamp Black/Ivory Black CADMIUM ORANGE CADMIUM SCARLET CADMIUM RED MEDIUM ALIZARINE CRIMSON MAGENTA PERMANENT GREEN LIGHT PHTHALO GREEN PHTHALO TURQUOISE PHTHALO BLUE ULTRAMARINE BLUE ULTRAMARINE VIOLET So those are just a handful of options for color palettes but there are literally hundreds of possible palette combinations which can yield beautiful mixtures to paint with so it's a good idea to play around with a few so you can find out what suits you best. The palette I have been working with up until now has been a warm/cool primary palette consisting of a warm and cool version of blue, red and yellow. I tend to use Ultramarine Blue and Phthalo Blue, Cadmium Red Mid and Alizarine Crimson, Cadmium Yellow Mid and Cadmium Yellow Light. Depending on the subject I'll often include Cadmium Orange, Yellow Ochre, and Burnt Sienna. I have an aversion to green so I don't often use a tubed green on my palette. That's something I intend to remedy though in going through this course with you. I've been using Titanium White exclusively, though I'm going to have a play with something like a zinc/mixing white now too. The best way I've found to try out different palettes is to just choose a few colors you're interested in and make a few little paintings with those colors - this keeps it fun and interesting without having to struggle through a big painting when you might not be feeling comfortable with the new mixtures. Color Charts By far the most comprehensive way to learn about color mixing is to make your own color charts. 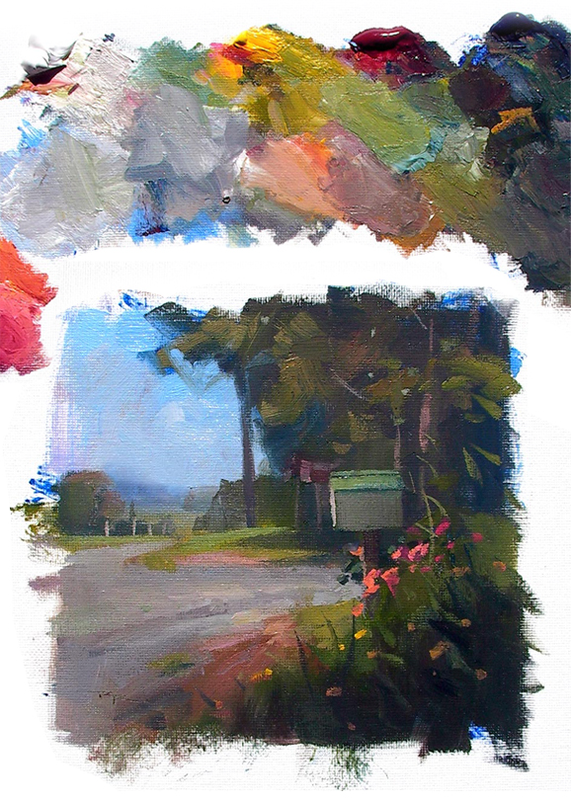 This practice comes highly recommended by American artist Richard Schmid, who is a living master. It can however be a very dull and time consuming exercise for most people who simply don't have the patience to go through the whole process. However, for the sake of those who do have the tenacity to do this I'll show you how to build your own color charts. Color charts are about discovering what your colors can do when lightened with white, and when each color is mixed with every other color. Here's how to make the first chart: 1. Choose a surface like canvas board, masonite panel or illustration board coated with gesso. 2. Count the tube colors you would like to use in your charts. Lets say you have 6. Measure out a grid of 1" squares 5 high x 6 wide with a quarter inch space in between each square. Lay this out using ¼" masking tape. 3. Take your lightest color (eg. Cad yellow light) and paint that into the top left square, making sure the paint is thick enough to cover the canvas. 4. Using a palette knife to mix on your palette, mix enough white and yellow so that the mixture is nearly white, but still exhibits some yellow. Paint that into the bottom left square but leave a glob on your palette. 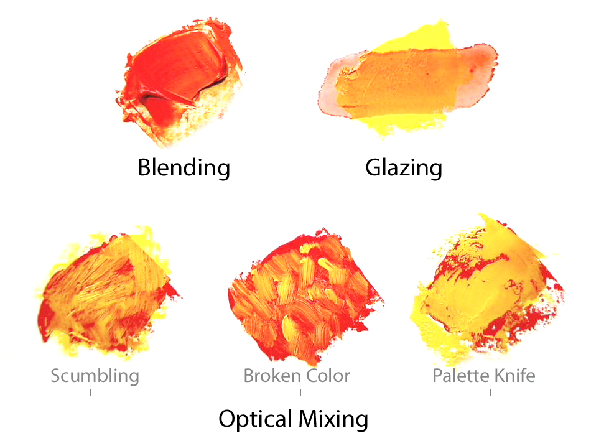 6 6 Mixing Methods There are 3 basic ways we can mix paint to make different colors: blending, glazing, and optical mixing. Each method affects color differently so it's important to have all three in your bag of tricks. Blending is the simplest method - just mixing two colors together creates another color. You can mix them on the palette or the canvas, but it's better to mix on the palette most of the time unless it's your intention to make your canvas look like a palette. Glazing is applying a thin transparent mixture of paint and medium over another, usually dry color. Slightly higher Chroma can be achieved by glazing than by blending or optical mixing. Glazing is best done with transparent paint - using opaque paint to glaze with will work but it looks a little chalky. Optical Mixing allows colors to mix within the eye by placing many small bits of a color next to another color. From a distance these colors join together in the eye creating a shimmering effect that's not possible with blending or glazing. There are a few different ways of achieving this optical mixing. The most common method is probably scumbling, where thick color is dragged over dry paint creating a broken surface which reveals both layers of paint. Another method is broken color, where many small different colored daubs or strokes are placed side by side. Dragging a palette knife loaded with wet paint over a previous layer is another common method. It's very easy to paint an entire painting using just one mixing technique, but if you can remember to use these 3 mixing methods within the one painting it can make for a much more dynamic and interesting work of art. Using multiple mixing techniques in a single painting adds interest and dynamism. 7 7 Transparency & Opacity Different paints have different opacities. Opaque paint tends to cover what is underneath it easily, whereas transparent paint tends to let the background show through. Semi-Transparent paint is obviously somewhere in between the two. The opacity of each color is written on it's tube. It's good to know this when it comes time to choose a color to glaze with. An interesting thing about transparent paint in relation to color is that when you add white to a transparent color it's chroma actually increases for a certain amount and then begins to decrease, whereas adding white to opaque color reduces its chroma steadily. Transparent colors yield slightly higher chroma in mixture with white. Color Relativity When we mix color as painters we are usually trying to match a color we are seeing or make a color that plays well with it's neighbors. Our first hurdle to mixing color well is seeing color and understanding it's relationships with it's neighbors. When you know how to do that, that's half the battle won already. We've already begun to learn how to do that in the previous chapters, so let's expand on that now. As we've already found out, color is relative, which means our perception of it changes depending on it's surroundings. This means that when we are mixing our colors for painting we don't need to worry about getting the colors exactly the same as the individual colors we are seeing in our subject, but we DO need to get the RELATIONSHIPS between the colors right. B is the same color as A. 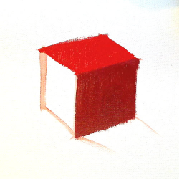 8 8 For instance, if we're trying to paint this red cube, it doesn't matter if when I start out that I don't get the color for the top face exactly right, because the important thing is to make the next color in your painting have the same relationship with the first color as what you are seeing in your subject. So if in the subject the dark side is 2 steps darker than the top face, with slightly less chroma, and is a bit cooler, that RELATIONSHIP is what you should be trying to duplicate in your painting. You see it's not the right color that's important, it's the right relationship. Relationships are the key to excellent painting. Ever had muddy looking color in your painting? Ever not had it? Muddy color is just color that has the wrong relationship with it's neighbors. It's either the wrong value, hue or chroma. Ok, so we've got that - it's the relationship between colors that is important, but how do we get the first color close enough to what we are seeing? How do we match a color? Matching Color Here's how I match a color... Step 1: Examine your color. Examine your subject color closely using squinting and your color checker to determine its value, hue and saturation in comparison to other colors in the scene and the colors on your palette. Remember not to squint when examining hue though - better to use the fuzzy one-eye because squinting darkens the color. Step 2: Choose the closest tube color/s. Matching a Color Examine Choose closest tube Color Adjust Value Adjust Hue Adjust Chroma Decide which of your tube colors is closest to the subject color. If it is a secondary color, mix your primaries to achieve the secondary color. Tip: Use or mix a color with a higher chroma than your subject color. This is because as you adjust the value and hue next, your color will lose chroma, so you need it to be as high as possible to start with. To mix a color which has the highest possible chroma use colors which are closest together on the color wheel. The further apart your two colors are on the color wheel the grayer your mixture will become. For example, if you want to mix an intense orange you would mix cadmium scarlet and cadmium yellow light together because they are closer to each other on the color Mixing adjacent colors yields higher chroma. 9 9 wheel than say cadmium red mid and cadmium yellow light. Think of it like this, the furthest away a color can be from another color on the wheel is directly opposite it and if you add opposite (complementary) colors together you get gray, or gray brown, so the closer your colors are to each other on the color wheel, the less gray your mixture will be. Step 3: Adjust the Value. Check to see if the value of your color is the same as the value of your subject color. If it's different, you'll need to darken or lighten your mixture. Adjust Value Lightening a Color Darkening a Color The Problem with White and Black When some people think about 'lightening or darkening a color' they immediately reach for the white or black paint. There are a few problems associated with this practice though. When we add white or black to a color to lighten or darken it, it reduces the color's chroma. This is not a problem if you want dull darks and pastel or chalky lights, but if you want your color to retain a high chroma you need a better way to adjust it. You will find out how to do this through trial and error - and that's really the only way to cement this information in your brain, but if I give you some pointers to start with it will help speed up the process. To Lighten a color you will need to add white or yellow to raise the value. Adding either one or the other will create a hue change as well as a value change. Adding white will push the color towards the blue-violet side of the color wheel - cooling it. Adding yellow will push the color towards the yellow side of the wheel - warming it. Adding both will produce a more neutral color change. You need to decide whether your color needs to be warmer or cooler or neither as you lighten its value. Trial and error is going to be your best friend here, so my advice is to try little bits at a time, and not mix the whole pile - find out what will work first. Darkening a color is a trickier thing than lightening a color. You can just add black of course - that's the first assumption we make. But see what happens when you add black to yellow. You get olive green (which can be useful), but it's not a dark yellow. Adding black creates a color shift and lowers the chroma of most mixtures which is often unwanted so we need a smarter way to darken colors and unfortunately there is no system that works for all colors, so let's look at them individually. To Lighten a Color Adding Yellow pushes a color towards yellow - warming it. Adding White pushes a color towards blue/violet - cooling it. Adding black to change a VALUE will also change the HUE. 11 11 To Darken Blue Good news, blue is already pretty dark, so if you have a light blue mixture you need darkening just add blue. If you want to get your tube blue darker just add a dark red like alizarine or burnt sienna, then you could add a little black to get as dark as possible. 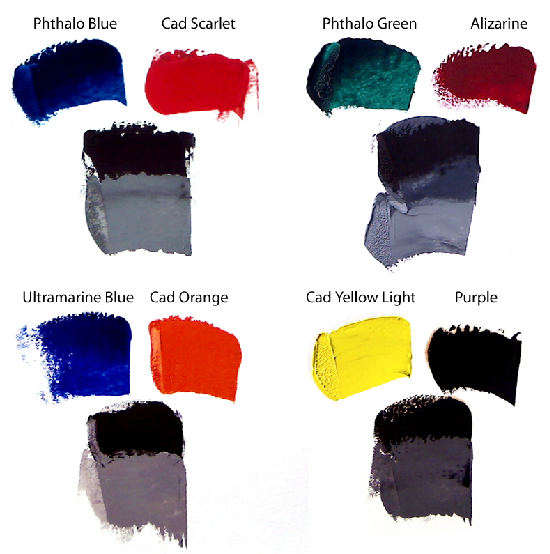 There are of course tube blues like cerulean and cobalt blue which are relatively light to begin with, these can easily be darkened by adding one of the darker blues like ultramarine or phthalo. Phthalo Blue Alizarine Black To Darken Purple Again, purple is dark to begin with, so if you want it darker, just add it's darkest constituent color, be that red or blue, and you can add black for your darkest possible value. To Darken Red To darken cadmium red, try adding alizarine or burnt sienna. To make it darker again, add ultramarine, and then black if needed. Ultramarine Violet Phthalo Blue + Alizarine Black To Darken Orange Dark orange is brown, so a simple gradation might be orange, add a little red, yellow ochre with some red, burnt sienna, and then adding black if required. Cad Red Medium Which White to Use? Zinc white, sometimes called Mixing White is best for color mixing as it is more transparent than Titanium White, which is good for strong opaque highlights but tends to overpower colors in mixture making them appear chalky at times. Alizarine Black Which Black to Use? Ivory Black or Lamp Black are both more transparent that Mars Black and are better to use when darkening a color (when required) as they darken colors without overwhelming them. Cad Orange Obviously these are just general guidelines and you will find through your own experience with your own paint which mixtures work best for darkening or lightening colors. Okay, let's get back to the process of matching a color. Yellow Ochre + Cad Red Medium Burnt Sienna Step 4: Adjust the Hue. 12 12 Now that you have the right value you can compare the hue of your mixture with your subject color. Ask yourself the question 'is my mixture warmer or cooler than my subject?' For instance if your purple is too warm (heading towards red) you can cool it by adding a touch of blue to it. It pushes the color towards blue. Some artist's call this 'bending' or 'nudging' the color. Note that if you add a color which is lighter or darker than your mixture you will need to readjust the value by going back to step 3. If you can't seem to get the color just right at this point, just get it as close as you can because what's more important is to get the correct value. Adjust the HUE: is my mixture too warm or cool? Goal Color My Mixture Warm Mixture too warm. Leans red. 2 Add blue + white. White restores Value. Correct HUE. Cool Step 5: Adjust the Chroma. Now that you have the value right and hue right, look to see if the chroma is the same as the goal color. The question to ask is 'How close is the color to gray?' If the chroma is too low you will find it very difficult to increase the chroma at this point. You are likely to add more and more paint and end up with a big pile of lower chroma color which is the wrong hue as well. This is why you need to begin your mixture with the highest chroma possible. If you think you can do better, scrape it off and return to step 2. If the chroma is too high, there are two ways to subdue it; one is to add a neutral gray of the same value as your mixture. Mix a neutral gray with 50% black, 50% burnt umber and white. Another way is to add the color's mixing complement - opposite on the color wheel. This is a very inaccurate way to do it but can produce some pleasing results due to the opposite nature of the colors which creates a sort of visual vibration. Either way, the color you add should be of the same value before you mix it so that you don't have to adjust the value again. Ok, so here it is again - to match a color Adjust the CHROMA: is my chroma too high or low? A Goal Color B My Mixture A How close is my mixture to gray compared to my goal color? B Chroma too high. Add gray or Add complement. Correct CHROMA. 13 13 we do this: 1. Examine the subject color. 2. Choose the nearest tube color or secondary color. 3. Adjust the Value, keeping the Chroma high. 4. Adjust the Hue. 5. Adjust the Chroma. These are the 5 steps to matching a color, but looking at it as a whole process like this it looks pretty cumbersome - I mean, can't we just throw some colors together and get it close enough? Sure you can do that - you can do that easily when you've been painting for a long time and this whole process has become intuitive, but for the beginner it's just not possible to get it right every time by mixing haphazardly - we all do a lot better when we have a process to follow. Let's get our paints out now and try using this process to match some colors... Matching a Color Examine Choose closest tube Color Adjust Value Adjust Hue Adjust Chroma Exercise #1 - Color Matching Make these colors by following through the color matching instructions word for word. Place your color in the blank boxes. Sometimes you won't have to go through the whole 5 steps to reach your goal color - sometimes you might have everything right by the time you get to step 3 or 4. Remember this process is meant to train your brain to think about color in a methodical way and when that starts to happen this process will become second nature, like riding a bike. Exercise #2 - Red Cube Study Okay, now that your paints are out and you're all warmed up, let's try using our new color mixing knowledge to paint a study of the red cube. Try and set it up in exactly the same position and lighting as you had it for your value studies in chapter 4 - that way you'll already know what the value relationships are like. 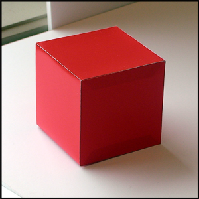 15 15 Low chroma colors like the cast shadows from the cube can be really tricky to figure out. My rule of thumb is that if I can't decide what the main color is, it's probably a gray - which is another way of saying that it has really low chroma. Sometimes it's just helpful to restate something in a different way like that. Now that I know it's a gray I just ask myself is it warm or cool compared to something else in the scene I've already painted. So I use my color checker and the fuzzy one eye and start making comparisons like that. It's tricky making comparisons against something so different though, so what I'll often do if I can't figure out the hue relationship is to just mix a gray of the correct value and place that on the painting. Once it's on the canvas it's much easier to compare your painting to your subject and adjust your gray until it's the right temperature. I've used the 2 complementaries of Ultramarine Blue and Cadmium Orange to mix this warm gray, and as it gets lighter and cooler I just add more and more white, and a touch of blue in the lightest areas. Again, that's due to the cool bluish light coming in the window. If you are using a light bulb to light your scene it's likely to be a very warm yellowish light, which would mean adding yellow to the mixture as it got lighter. It would also give you cool shadows instead of warm ones like these. So that's another good rule of thumb, but one which also has its exceptions: Warm light makes cool and cool light makes warm shadows. You can usually see that contrast in temperature in any scene. With landscape painting our warm light is from direct sunlight on a clear day and our cool light is from an overcast day. Exercise #3: Complementary Grays Most colors we see in nature are at least a little gray. Unless you are very close to a flower or some other intensely colored thing, light and atmosphere combine to lower the chroma of most things we are seeing, so as a painter it's very important to know how to mix grays. There are 2 ways to mix a gray: 1. Mix black and white together. (You can add a bit of burnt umber to make a more neutral gray.) 2. Mix 2 complementary colors together. The beauty of mixing complements together is that they make it very easy to control the temperature. Too cold? - add a bit of the warm color. Too warm? - add a bit of the cool color. Nice and simple - just the way I like it. To find out about your complementary grays just mix a few of them together as shown in the lesson notes. Some of them are quite dark so you'll need to add white to be able to see what sort of gray it is. Some of my paintings are done using just 2 complements plus one other color. It's an interesting challenge to see what range of colors this small palette can produce. You might like to try a few complementary paintings of your own. 17 17 Advanced Exercise #5: Transposing This exercise will really reinforce the concept of color relationships. 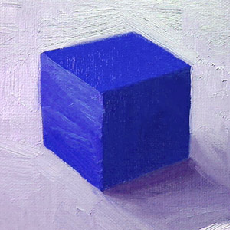 What I want you to do is use the red cube setup, but paint it as a blue cube. By doing this you have to think purely in terms of relationships, so that instead of trying to copy the colors in front of you, you are copying the relationships. Good luck with that one! Seeing and mixing color is obviously a lot trickier than it looks at first. There don't appear to be enough hours within a lifetime to master color, and you may feel, like I do that you never really 'arrive', that it's an infinite series of stepping stones. The joy of this is found then, in the doing, in each moment of discovery - knowing that you are a step further along, and with each step whole new vistas open up for you to explore and play in. I love what Emerson said about this, "Unless you try to do something beyond what you have already mastered, you will never grow." So I hope you will grow along with me and do these painting exercises with me. See you in the next chapter. MASKS & CHANNELS WORKING WITH MASKS AND CHANNELS Masks let you isolate and protect parts of an image. When you create a mask from a selection, the area not selected is masked or protected from editing. Standards A complete list of the standards covered by this lesson is included in the Appendix at the end of the lesson. Contrast ratio what does it really mean? Introduction...1 High contrast vs. low contrast...2 Dynamic contrast ratio...4 Conclusion...5 Introduction Contrast, along with brightness, size, and "resolution"
Call Scenarios. Tell them how you'll help them turn their transformation into cash.